Today’s ride: The Patuxent Rural Legacy Ride is a Metric Century starting in Croom Maryland. This is a rolling course that parallels the Patuxent River. The rest stops are scenic, most of them with views of the river, and the roads don’t have much traffic. The ride is very well supported and the course is clearly marked. It ends with a picnic at the ride start. The Experience: Two of our group needed to leave early to attend a wedding, so we all got to the ride start in time to set out at 7 am. The weather was cool, clear and still when we set out. I’m of the opinion that you should dress for mile 5, not the start. Once you’re warmed up you don’t need the extra clothing, and I don’t like to carry things I don’t need. We rode easily to the first rest stop, with the group staying together. This time it was Myself, John Koehnlein, Carol Linden, Ron Tripp, Eric Sanne and Tony Lehr. A rider we knew named David was with us as well. I love riding in rolling terrain. The constant changes mean you must react to quick climbs and descents. They provide a variety that makes a ride seem more interesting. As we began the second leg, I lifted the pace a little. 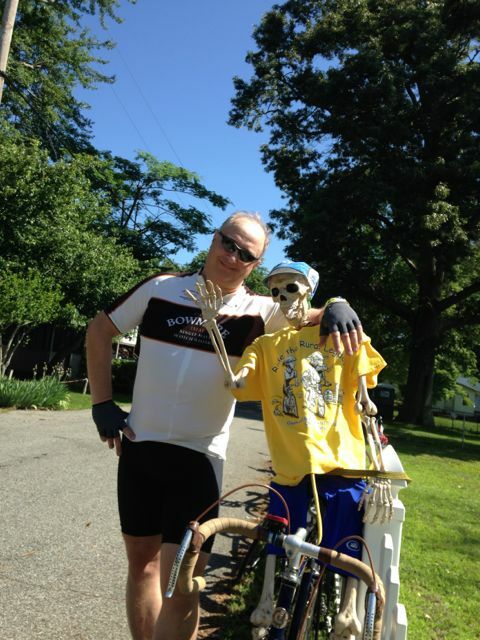 We built up some momentum, and arrived at the second rest stop, where we posed with a friend – a skeleton wired to a bike. This was a popular activity with the riders at the stop! Before we left, we were caught by Carmen Legato and another rider he’d been riding with, Christy. Our growing group rolled out and lifted the pace again, passing other riders and moving along smoothly. The last rest stop was at the Merkle Wildlife Sanctuary, which in previous years had been the start/end point. I saw more friends on the way out. We finished strong in the final 8 miles, one of the rare rides where we built the pace from start to finish. By the end, the music I was thinking of was working with our pace – particularly the last selection below! Eric, Ron and Tony all rode well. On a ride where the pressure kept building, they all held on and handled the pace with ease. After the ride, we got together for beer and laughter. We also got lunch courtesy of the Oxon Hill Bicycle Club, who sponsored the ride. My friends Judy and Dave and their son Rad joined us for a while, and fellow PPTC member Deb Reynolds visited us too. It’s good to take some time to be social and enjoy the company of friends after we’ve shared a ride. Selections from my mental iPod during the ride: “E=MC2” by Big Audio Dynamite, “Circus” by Spirit of the West, and “She Sells Sanctuary” by the Cult. Stats: 64.02 Miles ridden. When you find another gear, both for power when you climb and speed on the flat, whenever you want one, you know it’s a good day! 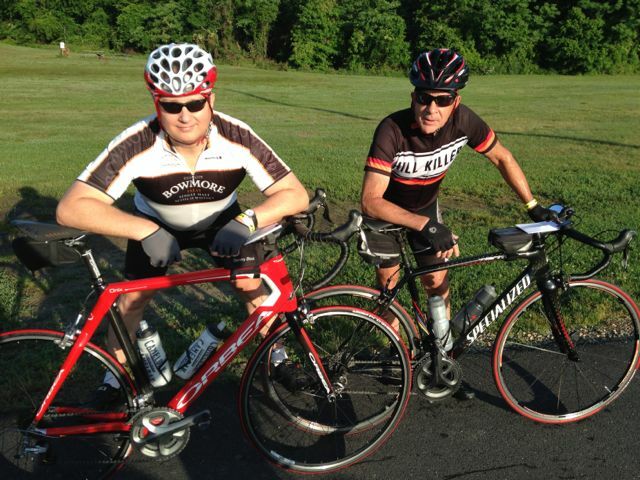 With John at the ride start. With a friend at the second rest stop! 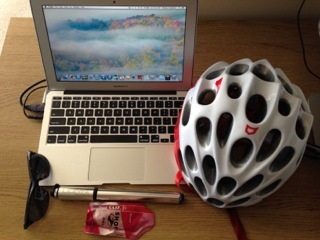 This entry was posted in Cycling on May 31, 2014 by kitefencer. what a great day. truly a gift for anybody who wanted to be outside. there were spots on the route where the scent of honeysuckle was thick and sweet & smelled of summer. that hill coming out of merkle made no sense. we were already at river level so how could the road drop that steeply & then the climb on the other side. what a great day.